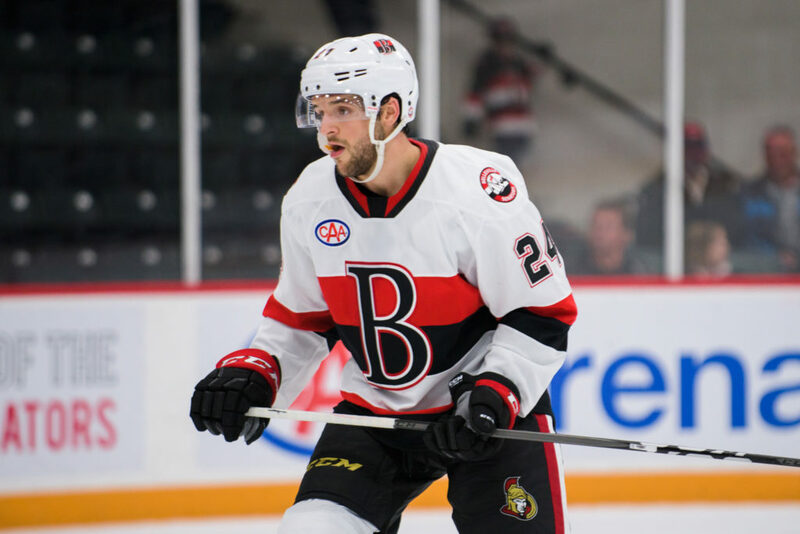 The Belleville Senators will look to get back to winning ways Friday as they welcome the Toronto Marlies to CAA Arena for the first time this season for back-to-back games. Belleville (5-7-0-0) is mired in a two-game losing streak after defeat in Syracuse last weekend but will be looking to get back to winning ways in the Battle of Ontario. The Sens remain ranked in the Top 10 (seventh) on the power play in the AHL’s Eastern Conference. Toronto (4-4-0-2) enters tonight’s contest without a regulation defeat in their past five games and sit sixth in the North Division, one spot above Belleville. The Marlies have leaked goals this season giving up 43 already through just 10 games. Toronto is also the least penalized team in the league this season amassing just 93 penalty minutes thus far. The Senators had some good news in Syracuse as forward Andrew Sturtz returned to the line-up after missing nine games. Jack Rodewald was also returned to Belleville Thursday as looks set to re-join the line-up tonight. Mike Condon was finally assigned to Belleville earlier in the week after being placed on waivers. Sens head coach Troy Mann has yet to reveal his goaltending plans for the weekend but expect Condon to start one, if not both, games against the Marlies. Friday is the first meeting of the season between the two Ontario teams. Last season, Belleville won just three of the 12 contests and just one of those victories came at home. The two teams will square off 12 times again this season. Sens forward Paul Carey has points in five straight games which ties Filip Chlapik’s franchise record set last season. All five points for Carey have been assists after he was held pointless in his first game of the season with Belleville. A veteran of 770 NHL games, Sam Gagner still continues to play for the Marlies on loan from Vancouver. The 29-year-old has nine points (five goals) in 10 games with Toronto this season. Saturday’s game starts at 7:00pm and can be seen on AHLTV and also on Facebook Watch. Fans can also watch tonight’s contest at Shoeless Joe’s in Belleville.